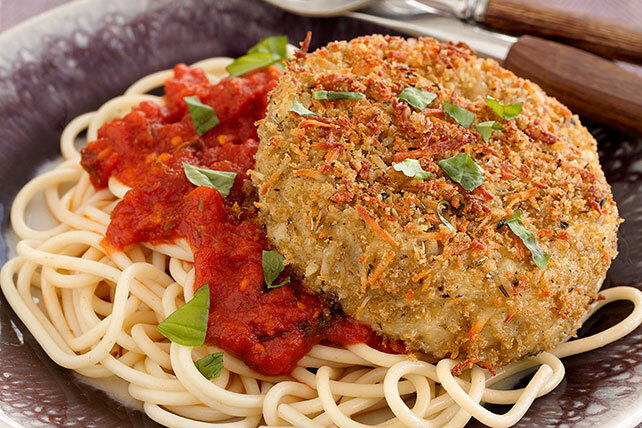 Discover our Healthy Living Easy Eggplant Parmesan recipe. This simple take on a classic is ready in just 30 minutes. Cover baking sheet with foil; spray with cooking spray. Combine bread crumbs and cheeses in shallow dish. Dip eggplant slices, 1 at a time, in egg then in cheese mixture, turning to evenly coat both sides of each slice. Place on prepared baking sheet. Bake 12 min. or until lightly browned. Meanwhile, heat sauce and cook spaghetti as directed on package, omitting salt. Drain spaghetti. Serve topped with eggplant and sauce. Garnish with fresh basil just before serving.